We offer top-rated moving services to be your trusted Antioch movers. Meathead Movers clean-cut student-athlete movers are dedicated to fulfilling all your moving needs to get you safely and happily into your Antioch home. Welcome to Meathead Movers of Antioch! If you are in the market for Antioch movers, we are the moving company for you! Our professionally trained student-athlete movers and our moving concierge service are here to help you with every stage of your move to, from or within Antioch. Located on the banks of the San Joaquin River, Antioch is a beautiful Bay Area town. The city offers a variety of employment, shopping and dining, and recreational opportunities. The town has plenty of activities including a County Fair, a golf course, and even a water park. Because Antioch is a part of the larger San Francisco Bay Area, its residents can enjoy all the extensive entertainment, dining, sightseeing and retail options the metropolitan area offers. 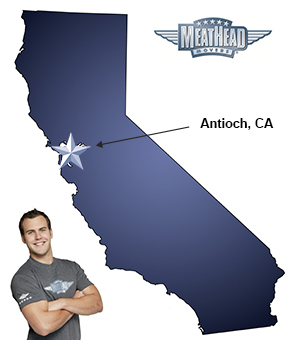 If you are considering a move anywhere in California, Meathead Movers is here to help. Our moving company specializes in local, long distance, and commercial moves with top ratings in every community we service. We also provide reliable packing, storage, on-site relocations, and our distinctive moving concierge service. All our student-athlete movers are thoroughly screened and trained before their first move. With branches throughout California, we are your one-stop resource for all your moving needs. In fact, you can see what your neighbors have to say about our Antioch movers! With a 100% satisfaction guarantee, the only thing you have to lose is the stress that comes from moving! Contact Meathead Movers today for a free moving quote, and learn how we can help you on your next move! Moving to Antioch? Here are some helpful resources. Moving is very stressful! We had been in our home for 25 years and we had enough stuff and junk to prove it! The Meathead Movers were incredibly competent, efficient, and so, so kind and friendly! At no point did they ever make us feel badly about the way we packed things or the amount of junk we had. The movers were so wonderful...they felt like family members without the obligations! We have two very large dogs that, despite being in the way, were loved and cared for by these very fine men! I can not say enough kind and good words about Meathead Movers! We woke up the first morning in our new home, less stressed than we could ever have imagined after a long distance move because of the fantastic job by Meathead Movers!!! You are on time, polite, and take great care in packing and loading my stuff, while being uick and efficient.